This talented musician comes from Texas, playing several instruments as well as sing. 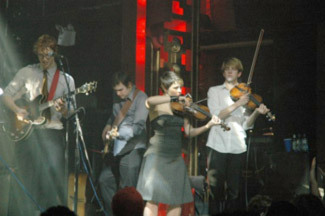 The songs are modern but played in a whispery tone that flirts with a bit of country. Her album creates a unique and mysterious atmosphere that’s hard to describe. 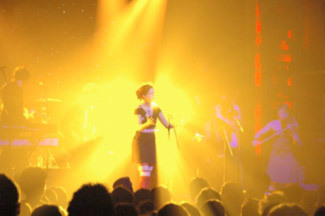 Surprisingly, she was quite bubbly on stage despite her songs of pain and vulnerability. Definitely catch this underrated crooner next time she comes around. 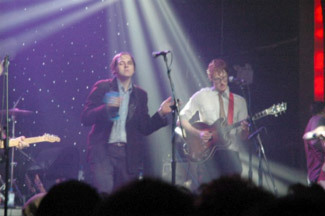 The very over hyped, much anticipated Arcade Fire storms into NYC for a show of eager fans who patiently waited for their return since CMJ. It’s been hard to not notice all their images and references in all the music magazines and internet websites. They were slated to be the “Next Big Thing”. 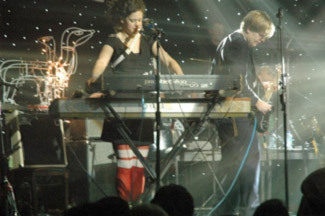 With all this pressure to save the dull music scene of 04, was The Arcade Fire up for the challenge? Final Fantasy opened up, which was basically this guy with an amped up violin and a looping device. I don’t know anything about Final Fantasy and if anyone knows anything or has access to his recordings, please tell me. It took a few songs for me to get into his music, but I was hooked by the end. He created these textual compositions by looping melodies on his violin and overlapping them with other live violin loops. After 2 minutes of musical construction, I was amazed on what he had created with just one instrument. Now, I have been listening to Funeral a lot and it has continued to amaze me. The blend of orchestral arrangements with biting lyrics makes this emotional album one of year’s best. The album is a rollercoaster of pain and remorse that has the building momentum of Godspeed You Black Emperor! but with heartache vocals that help guide us through the darkness. This is one of the very few albums that takes us on a journey from start to finish without wavering its designated course. So how were they live? I will admit that I had wanted to hate them from the get go. I get annoyed when all the music rags and critics get all head over heals for bands that doesn’t deserve any amount of press. It’s been quite frustrating trying to get an honest review of music lately, and seems like there’s always someone promoting the next big act. The large band took the cramped stage full of instruments and lighted props, and it felt like release of air pressure in the room. 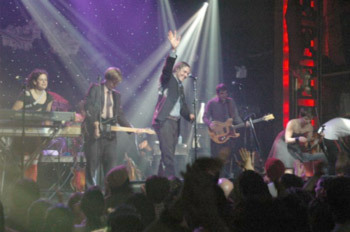 The crowd welcomed them to the sold out Bowery. The music filled the room and by the 2nd song I knew that this was going to be an intense show. They played many songs of Funeral but when they got to the song Neighborhood #2, they finally erupted. The band unleashed a cacophony of sound I have never experienced live before. They were proving that they are a force to be reckoned with. So yea, the show was amazing. The band is incredible, on record and in the live setting. This is one band that deserves the hype.